"Sitting all day at work is really bad for us，" says Lucas Carr, an professor in health and human physiology. Excessive sedentary time to be a risk factor for many physical and psychosocial health outcomes including mortality, obesity, cardio metabolic-disease risk, stress, and poorer cognitive function. 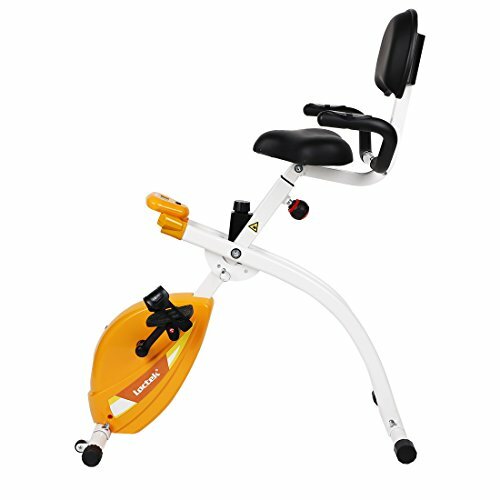 The Loctek Under Desk Bike Exerciser is the fun and easy way to tone your under-belly. This compact device quietly works the same muscles as stimulating the heart and blood vessels while toning your glutes and legs. There are no handlebars. As you work and pedal, you get a good workout as you are engaging your hips. An added health benefit is that while pedaling, you exercise your core muscles simply. The 2-position adjustable seat accommodates all heights. Max. weight capacity 300 lbs. Assembly required. 12. Maximum weight capacity: 300 lbs. ● Weight Capacity: 300 lbs. ● Overall Size: 40" x 28" x 21"
● Adjustable Seat Height: 30" - 34"